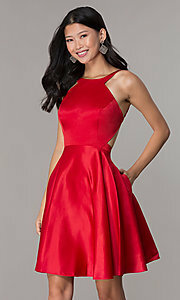 Make a red hot impression in this short homecoming dress from the designers at Dave and Johnny. In gleaming satin, this little red party dress is a stylish option for wedding receptions, semi-formal celebrations, and hoco 2019 parties. With a high-neck bodice, this satin designer party dress features cut-in shoulders and adjustable straps that circle the neck to reveal an open back. From the banded natural waist in back, the short satin skirt flares away from the hips to flatter the figure. Paint the town red in this vibrant short backless homecoming dress that is available in junior sizes.